Apple's iTunes software still represents the gold standard in migrating data between your Apple devices and your Windows-based PC. The website should automatically detect that you're using a PC and offer you a Windows version of iTunes. Decide if you want to receive email newsletters from Apple and enter your email address, then click the "Download Now" button. Windows will ask you if you want to run or save the file. Either answer works for installing iTunes: Running the file will install it right away whereas saving will allow you to install it later. If you choose to save, the installer program will be saved to your default downloads folder (usually "Downloads" on recent versions of Windows). After you've downloaded iTunes, the installation process will start (if you chose "run" in the last step) or the installer program will appear on your computer (if you chose "save"). If you chose "save," double-click the installer icon. When the installer begins running, you'll have to agree to run it and then go through a few screens of agreeing to the iTunes software terms and conditions. Agree where indicated and click the next/run/continue buttons (depending on what the window offers you). Use iTunes as the default player for audio files - Choose this if you want iTunes to handle all your audio files, including CDs, MP3s, podcasts, and downloads. Default iTunes language - Choose the language you want iTunes to be in. Destination Folder - This is where iTunes and its files will be installed. Unless you know what you're doing with this and have a reason to change it, use the default setting. When you've made your choices, click the "Install" button. Once you've done this, iTunes will go through its install process. You'll see a progress bar during the installation that tells you how close it is to being done. When the installation is complete, you'll be asked to click a "Finish" button. Do so. You'll also be asked to restart your computer to finish the installation. You can do that now or later; either way, you'll be able to use iTunes right away. 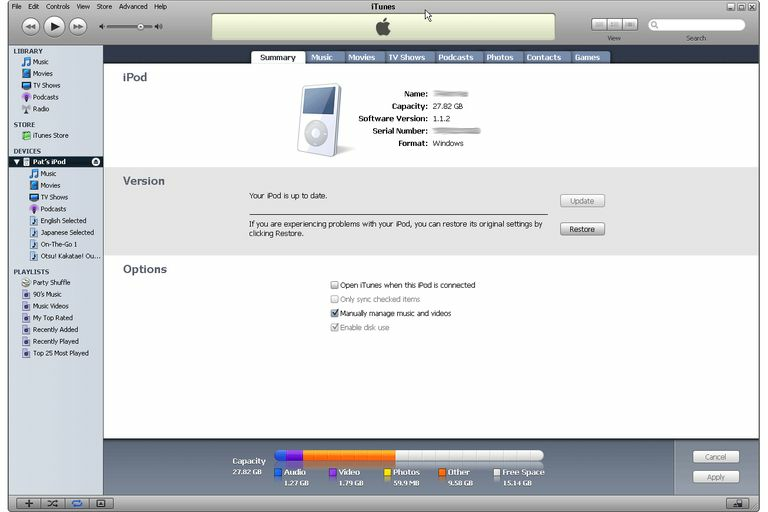 With iTunes installed, you may now want to begin importing your CDs into your iTunes library. The process of importing them will convert the songs from the CDs into MP3 or AAC files. Besides importing your own CDs to your new iTunes library, another important step in the iTunes setup process is to create an iTunes account. With one of these accounts, you'll be able to buy or download free music, apps, movies, TV shows, podcasts and audiobooks from the iTunes Store. Setting up an iTunes account is easy and free. And, with that, you've setup iTunes, set up and synced content to your device, and are ready to rock!